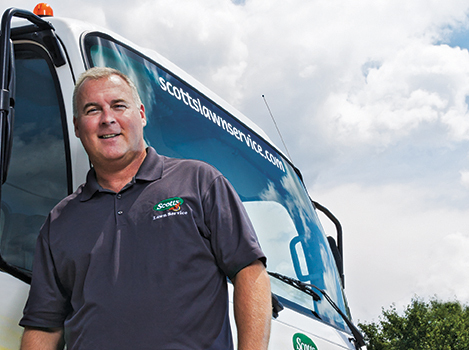 Fifteen years in, Scotts LawnService seeks to balance top- and bottom-line growth for a sustainable future. It’s no miracle that Scotts LawnService grew from zero to nearly $250 million in sales over the 15 years since it entered the market. As a division of the Marysville, Ohio-based lawn and garden products behemoth The Scotts Miracle-Gro Co., it had capital to make acquisitions—and it did so to the tune of at least $125 million in its first decade. During that time Scotts LawnService (SLS) absorbed more than 60 lawn care companies, including notables such as Emerald Green Lawn Care of Fort Wayne, Ind., J.C. Ehrlich’s Green Team of Reading, Pa., and The Lawn Co. of Cape Cod, Mass. 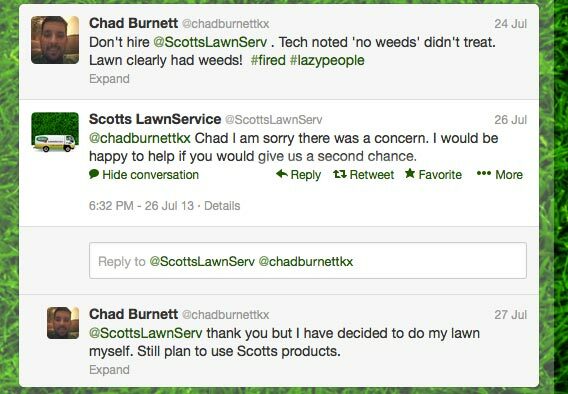 The question isn’t how Scotts got to be the second largest lawn care firm in the U.S., with 84 corporate locations and 90 franchisees today. It’s whether the 15-year-old company can sustain a level of quality and service that will allow it to gain market share in what it estimates to be a $6 billion category. Brian Kura sees nothing but opportunity. He was named president of SLS in June 2012, after serving in various business development, sales/marketing and leadership positions at Scotts Miracle-Gro since 1997. “We launched, we made it big and then we figured out how to run it,” Kura says, summarizing the SLS history. He details a handful of key SLS metrics pointing in the right direction. For example, after dipping during the recession, net sales in 2012 were up 4 percent year over year, nearly back to their 2008 highpoint (see chart). After the first three quarters of 2013, SLS is tracking at 4 percent sales growth for the year. Kura also points to the business’s record customer count—a half million strong with another 100,000 among franchise locations. And perhaps most importantly, he says customer survey marks are as high as they’ve ever been, with a rolling 12-month average of 88 percent of respondents rating SLS in the top two boxes: “highly recommend” or “recommend.” The company has been conducting customer surveys via a third-party every month for three years. As for the future, Kura says it’s about finding a sweet spot that allows the business to add to the top line, but improve the bottom line faster than the top line. A “high single-digit” growth rate is the target to achieve these goals, he says. How will SLS get there? There are a few ways: acquisitions within some markets, geographic expansion, selling additional services to current customers and customer growth within the core lawn care business. West of the Rocky Mountains is an area of opportunity for SLS. Majority of its corporate and franchise locations are found in the eastern and central parts of the U.S.
“There’s a list of 40 markets ripe for franchise sales and 20 markets for corporate locations,” Kura says, noting SLS differentiates the two by a potential revenue level within a 300-mile service area. Will the one-time acquisition machine start snapping up independent lawn care companies again? Kura says SLS’s focus in the last two years has been to buy back larger franchise markets, and it has done so in Salt Lake City, Utah; Nashville, Tenn., and Minneapolis. That said, during Scotts Miracle-Gro’s third-quarter earnings call in early August, CEO Jim Hagedorn said the company has cash for acquisitions after not being active for a few years, Columbus Business First reports. “SLS plans to be a part of that strategy and is actively looking at opportunities,” a Scotts spokesman said following that call. For SLS, acquisitions are mainly about buying customers, Kura says. The company has about a 70 percent customer-retention rate, which means it has to replace 200,000 customers a year. “If it makes sense, we’ll look at it,” Kura says of acquisition targets, noting client retention rates and quality service are the top considerations when SLS looks to buy. Scotts is nothing if not a seller of name brand products. In fact, the company credits much of SLS’s initial success to consumer recognition of the “green oval” logo associated with the 145-year-old brand. With that in mind, it’s no surprise part of SLS’s growth will come from a strategy to leverage other well-known Scotts’ consumer brands—Ortho for insects and Miracle-Gro for plants—and sell them to current lawn service customers. About 15 percent of SLS customers buy more than one service among Scotts LawnService, Ortho Pest Control Service or Miracle-Gro Professional Tree & Shrub programs. These offerings aren’t new, but there’s a greater focus on increasing their penetration, Kura says. For the most part SLS techs perform the additional services at the same time as the lawn care applications. The tree/shrub service includes Miracle-Gro plant food applications in addition to monitoring for insects and diseases. In some markets, mulch delivery and installation are an option (featuring—not surprisingly—Scotts Nature Scapes branded material). In Ortho’s case, lawn techs perform exterior perimeter pest control treatments quarterly. However, in Florida, Texas and Georgia SLS has begun selling indoor pest control. “A next step for growth—and it may be the biggest—is ‘crossing the threshold’ and selling Ortho in homes,” Kura says. Pest is seen as a prime opportunity for growth because Scotts estimates it to be an $8 billion category—25 percent larger than lawn care—and customers retain their pest services at a higher rate than lawn care services. The challenges here are several fold: 1). Sending a technician into someone’s home requires a higher level of scrutiny and training, 2). The regulatory requirements are in many cases stricter than in lawn care, and 3). The service standard in pest control is 24-hour availability. To ramp up the pest efforts, SLS has added a person with pest control expertise to its technical services team based in Marysville. Selling lawn care specifically to commercial accounts is one opportunity SLS is considering in select markets. It’s been testing it at four branches, including Columbus, Ohio, for three years, and Kura says it has done some work with national commercial landscape maintenance providers. “As we build a plan for 2014, the opportunity appears to be worth scaling,” he says. With opportunity comes obstacles and SLS’s are just like any lawn care company’s, albeit on a larger scale. For example, the ever-changing regulatory environment is a perennial difficulty, Kura says. “You make sure you stay compliant and hope it doesn’t get worse,” he says. In some cases, the company has worked proactively in partnership with officials and environmental groups. For example, Scotts announced in 2011 it would remove phosphorus from all its lawn “maintenance” fertilizers by 2013, and it accomplished that goal earlier this year. Because phosphorus is essential to initial turf root development, the nutrient will remain in its starter fertilizers for new lawns and also in its organic lawn food, as it occurs naturally in the organic material. The 2011 phosphorus-free announcement marked the expansion of a commitment made by the company in 2006 to stakeholders in the Chesapeake Bay area to reduce phosphorus content in lawn fertilizer by 50 percent. Now, SLS is voluntarily “P-free,” as is much of the lawn care industry. Another top challenge for SLS is finding and keeping good people, Kura says. “In a service business, you’re only as good as your people who interact with your customers,” he says, noting the technician’s role is the hardest to fill and retain. “That’s a lot of long hours dragging a hose in the heat of summer. “It can be a tough, demanding job,” Kura says. For the past five years the company has brought together all service area managers—a few hundred people—annually for three days to train them in “best application practices” or BAP, which include application techniques, compliance and safety. They’re responsible for taking the lessons back to their regions so every tech receives the same training. Technician turnover, which used to be nearly 100 percent, is down to about 35 percent, due in part to training, a “comeback” bonus, production bonuses and “truck sale” bonuses for selling add-on services, Kura says. Finally, finding new customers without violating any of the “do nots”—as in the do-not call list, restrictions on door-to-door solicitations and who companies can email—is a major obstacle. “It takes a significant number of available households out of the mix,” Kura says. Direct mail and door-to-door are the primarly avenues SLS gets customers. Right now less than 10 percent of its business comes from digital marketing, which for SLS primarily includes banner ads and paid search. 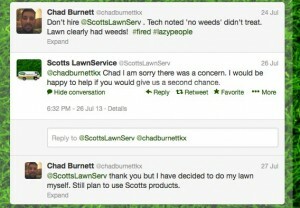 The company has ramped up social media efforts from a customer service standpoint (see sidebar, “Scotts LawnService does social media”) and plans to increase its marketing focus in this area. Again, Kura emphasizes the potential. Social media experts say not responding to customer questions or complaints online is equivalent to ignoring them to their face at your place of business. 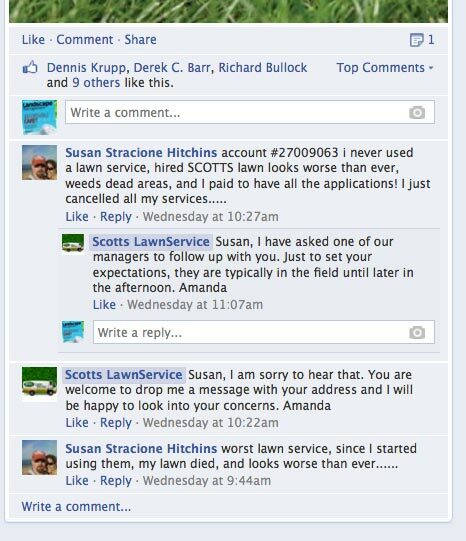 Although Scotts LawnService (SLS) acknowledges it needs to move the dial from only 10 percent of customers coming from digital marketing channels, it has stepped up from a customer service standpoint on social media channels like Facebook and Twitter. SLS has a dedicated social media person and is committed to resolving customer questions and concerns online. Here are two recent examples, showing how SLS’s responsiveness quells customer complaints before they get out of hand. When lawn care professionals think and talk about sustainability, they often refer to their products, says Chris Wible, director of technical services for Scotts LawnService (SLS). “That’s a key piece, but another is the consumer and another is the fleet,” he says. And he should know. Before taking this role in mid-2012, Wible was the director of environmental stewardship for The Scotts Miracle-Gro Co.
Just think, “What does the homeowner do when you’re not there?” Wible asks. Sharing proper mowing height information with consumers is a very easy way to reduce weed pressure, thus reducing inputs, extra trips for callbacks and other inefficient, unnecessary actions. SLS primarily conveys this information to clients in leave-behinds and service notes. Wible says techs meet at the branch level on Mondays to share what they’re seeing in the field and discuss appropriate customer communications for that week. The SLS technical service team helps develop tech notes appropriate for given weather and agronomic conditions, Wible says. The fleet has been a high-impact area for SLS the past two years. In fact, between 2011 and 2012, SLS reduced its total number of miles driven by 1.8 million, Wible says. That translates into fewer emissions and less fuel consumed, not to mention the efficiencies it creates for the business, he says, attributing the savings to more effective routing software programs and regional routing teams. One cost-cutting example is the use of notebook computers that report driver data, do batch information uploads when techs return to the shop and generate professional print-outs of regulatory information plus tech notes. The company uses software from Real Green Systems and has been for about a decade. 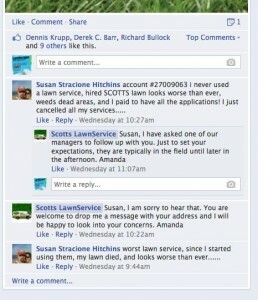 Real Green founder Joe Kucik also operates a Scotts LawnService franchise in Michigan. When it comes to running a successful business, Scotts LawnService (SLS) knows its frontline associates hold the cards for the company’s future. To foster goodwill and build its bench for the future, SLS sponsors a scholarship program with Ohio State University’s College of Food, Agricultural and Environmental Sciences. The Scotts LawnService Scholarship Fund, launched in 2009, was a natural fit with Ohio State, which boasts a well-known turfgrass program and is based in Columbus, Ohio, about 30 miles southeast of Scotts headquarters. The scholarship program, available to students with one year of school remaining, funds two people per year majoring in turfgrass science, crop science, landscape horticulture, entomology or related fields. In addition to covering tuition for a full year, it includes a summer internship at Scotts headquarters, exposing the students to project work in agronomics, supply chain, customer service, environmental health and safety and operations management. The program also offers a potential opportunity to work in a branch as a front-line associate after graduation. 1 Comment on "Zero to $250 million"